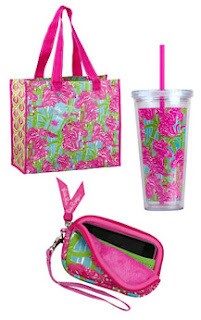 We are so excited to announce today's winner of the Razzberry Fizz Lilly Pulitzer giveaway. What a fabulous giveaway - and you thought so too, there were lots and lots of entries! One very lucky Clemson Girl reader will win a special Lilly Pulitzer prize package from Clemson gift boutique Razzberry Fizz. The prize package includes a market bag, double wall tumbler & a wristlet/camera case all in the pattern "fan dance". Congrats Crosby! Please email us (clemsongirlblog@gmail.com) by NOON EST Monday, Feb. 13th to claim your fabulous prize! Didn't win? Don't worry, you can still snag these lovely items for yourself from the Razzberry Fizz website. Special thanks to Razzberry Fizz for sponsoring such an amazing giveaway! !